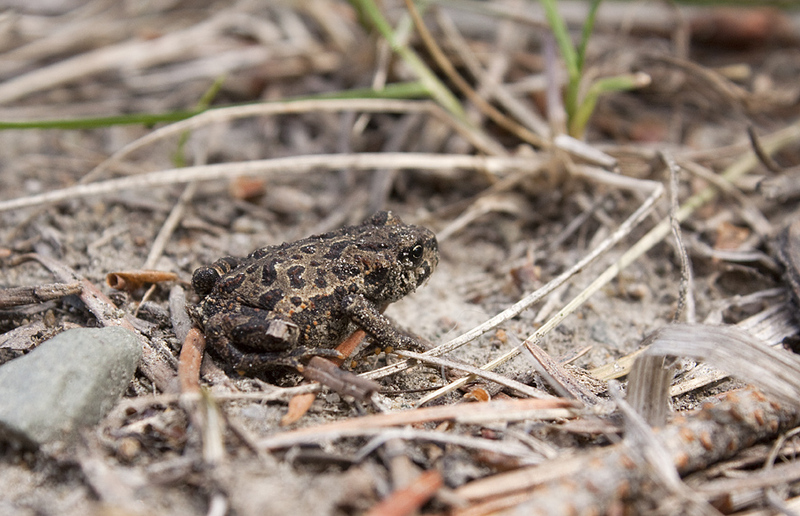 Volunteers from the Nicola Naturalist Society contributed to a study last summer (2012) of the migration of newly-emerged toadlets at Kentucky-Alleyne Provincial Park near Merritt. Hundreds of Western Toads lay their eggs in West Pond in the park and by mid-summer the shallow edges of this pond are swarming with thousands of tadpoles and newly metamorphosed tiny toadlets. In late July and early August these toadlets begin a slow migration into the forests where they will spend most of the rest of their lives, living on insects and worms. Unfortunately their migration route takes them across a road in the park during the peak of the camping and visitor season and many toadlets are killed. In 2012 BC Parks staff asked the Nicola Naturalist Society to help run a study to see what could be done to reduce these toadlet road-kills. Funded by BC Parks and under the supervision of professional biologists with Biolinx Environmental Research of Victoria, BC, the Nicola Naturalist volunteers visited the park numerous times. They set up automated monitoring cameras, counted toadlets along the shoreline and on paths and roads, kept notes on weather and helped with other tasks. For more information and photos of this project go to one of our earlier posts – click here. The results of the 2012 study have now been released in a report authored by the Biolinx Environmental Research team. The report shows the timing of the peak movements and also maps out where the toadlets crossed the road (see the map below). Based on the results of the study and the mitigation recommendations made in the report by the Biolinx biologists, BC Parks is now using this information to find a way to reduce the toadlet road-kill in future years. For a pdf copy of the full report (about 4 MB) click here: Kentucky-Alleyne Toad Report, FINAL Dec 2012. 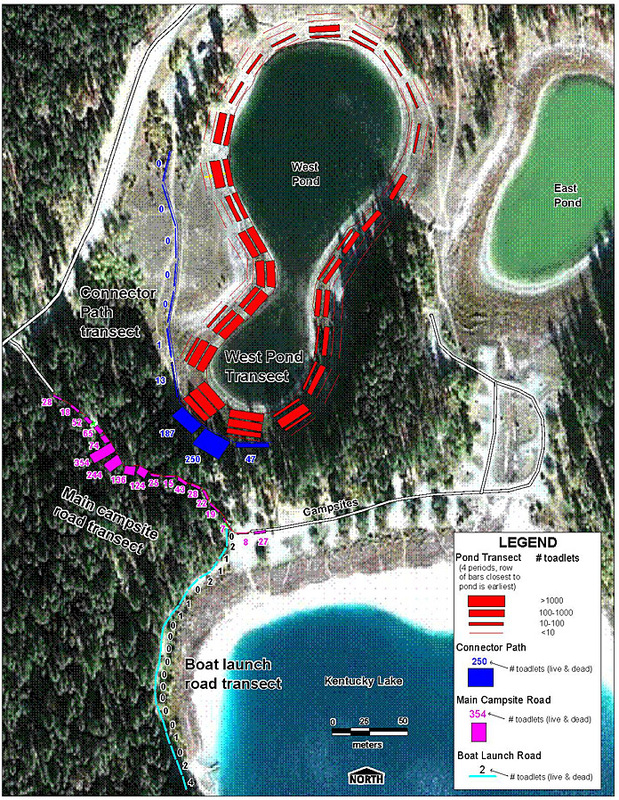 Map of the ponds and lakes in Kentucky-Alleyne Provincial Park showing the concentrations of Western Toad toadlets along the shores of Western Pond (red bars), where they crossed the hiking trail (blue bars) and where they crossed the road (purple bars). The thickness of the bars indicates the number of toadlets in each count sector.